We were all painfully aware of what goth had become throughout the 1990s: spooky dolls, mainstream industrial rock, weak Tim Burton films, and dyed-blue dreadlocked types wearing goggles, platform boots, and cheap-looking PVC to go out and dance to music that basically sounded like La Bouche with an unlistenable male vocalist. In this sense we were elitists, and it would be hard to apologize for having been that way. There are different kinds of elitism. Some focus on the eliteness of people, and and that couldn’t be further from what we were about. The Wierd thrived on nothing if not inclusion of people. But it was elitist in the sense of a standard of excellence in art that most people then could have been forgiven for assuming never got anywhere near so-called dark music. Following a brief silence, some of the party’s affiliates — Soren Roi, Nikki Sneakers, Hillary Johnson, and Jasper McGandy — announced a new weekly whose name immediately addresses the void Wierd left. Named after a song from neofolk band Death In June, Nothing Changes will have a similar musical scope and continue to provide local and touring bands with a venue and eager audience. What happens when authority meets idolatry? 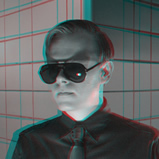 Find out this Wednesday, October 3, as Maxx Klaxon brings AUTHORITARIAN IDOL 2012 to The Lost Parade at R Bar. This will be the second in a series of shows featuring Maxx’s insurgent electropop, plus interactive video interviews with digital avatars of the presidential contenders. This performance will feature a replay of the first AUTHORITARIAN IDOL segment — presented at SPLICE on Sunday, September 23, to rave reviews — and the debut of a brand new segment. Join us at Solas for the fall 2012 edition of your favorite “eclectic electronics” salon! This month, 3 SPLICE veterans return with bold new multimedia performances — each artist will be premiering fresh material. Expect audiovisual surprises galore! I’m excited to be a part of THIS IS HOW MY BRAIN WORKS, at Radiator Gallery in Long Island City, Queens. The show, curated by Michael Lee, examines the contemporary practice of collage through its many iterations and permutations — ranging from works on paper to artist books, photographs, sculpture, textiles, and digital projections. 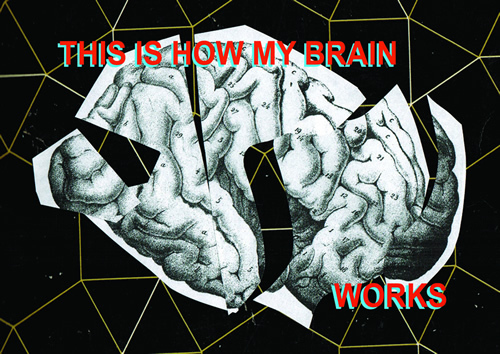 THIS IS HOW MY BRAIN WORKS features a variety of new collage projects, including my piece, SLOTS — a site-specific video installation, projection-mapped on to the stairway at the entrance to the gallery. 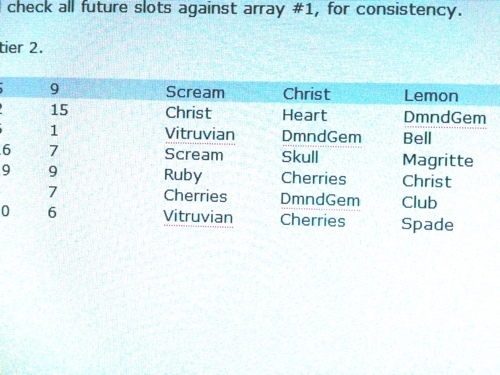 SLOTS is built around the metaphor of a slot machine. 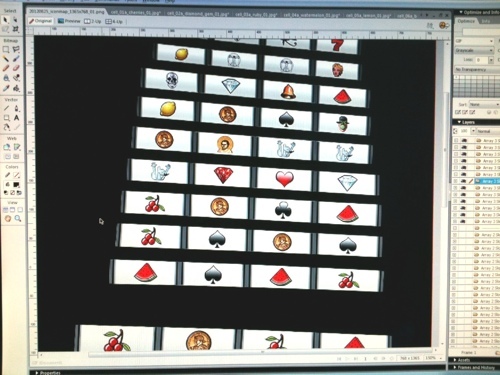 But I’ve augmented conventional slot machine symbols with iconic images of humanity from across the history of Western art. 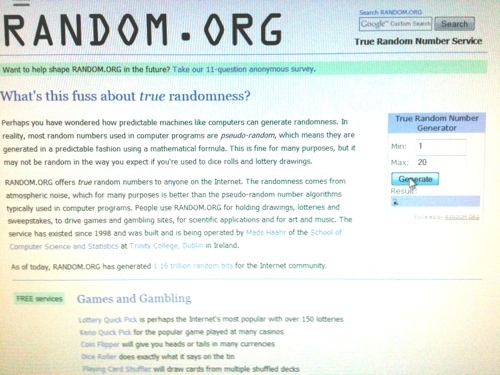 When the machine produces a winning combination, the “payout” is an interlude featuring one of a series of quotations, examining whether the art world is a set of steps that artists can climb to achieve success and significance, or just a game of chance, in which arbitrary forces hold sway, and everything is rigged. Other artists featured in the show: Donovan Barrow, Brian Belott, Natasha Bowdoin, Floto+Warner, Sara Klar, Todd Knopke, Michael Lee, Elisa Lendvay, Abraham McNally, Andrew Mount, Ryan Sarah Murphy, Francesca Pastine, Javier Pinon, and Leslie Siegel. The show runs thru September 30, and can be viewed until then during normal gallery hours (Saturday & Sundays, 12pm-6pm). 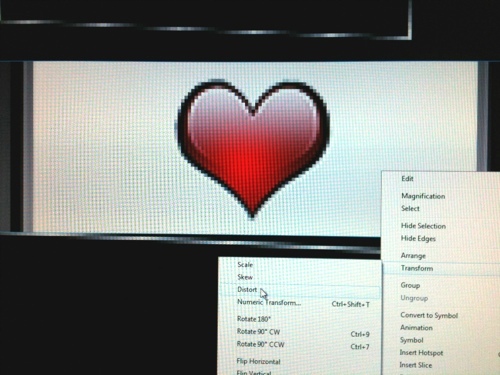 I’ve been staring at my monitor for hours on end, as I work on a new projection-mapped video art piece. 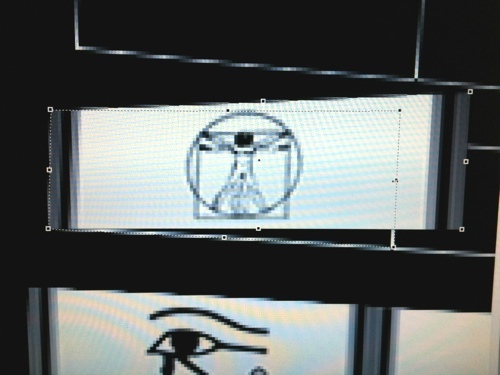 Here are a few glimpses of what’s filling my field of vision these days. 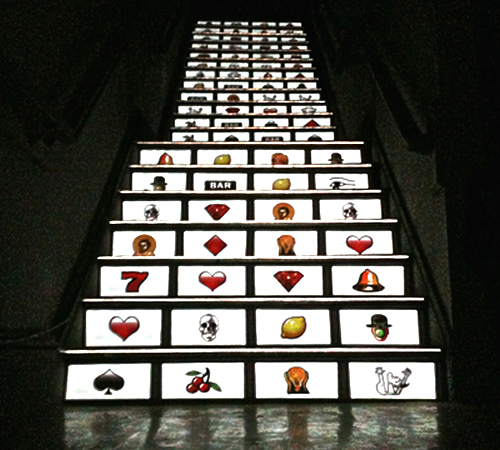 The piece is called SLOTS, and it debuts on Friday, September 7, at the opening of This Is How My Brain Works. On Sunday, April 22, join us for one of the biggest SPLICE throwdowns of all time! 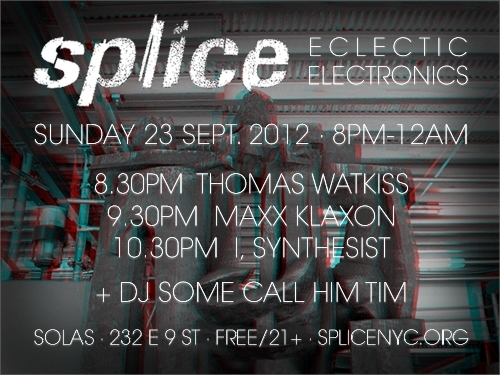 A lineup of five live acts — all SPLICE vets — will be on deck to help us toast six years of eclectic electronics in NYC. 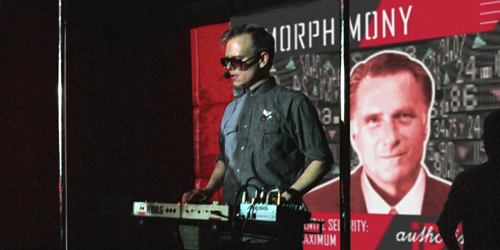 Every act will be covering a Kraftwerk tune or two, in tribute to our Teutonic electronic forefathers. 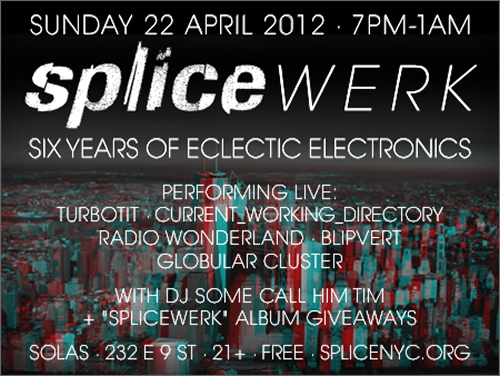 And we’ll be launching the shiny new SPLICEWERK compilation album, with giveaways and album previews all night long! 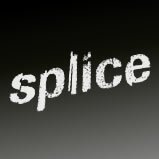 Giveaways and previews of the new SPLICEWERK compilation album!